America's highways allow people and products to travel to every corner of our nation. Along the way, these roads cut across the habitat of many native wildlife species. When these paths cross, collisions occur, and in greater numbers than most people realize. This presents a real danger to human safety as well as wildlife survival. State and local transportation agencies are looking for ways to find a balance among travel needs, human safety, and conserving wildlife. This national study details the causes and impacts of wildlife-vehicle collisions and identifies potential solutions to this growing safety problem. This Report to Congress focuses on tools, methods, and other measures that reduce the number of collisions between vehicles and large wildlife, such as deer, because these accidents present the greatest safety danger to travelers and cause the most damage. This document was funded in whole under U.S. Government contract DTFH61-05-D- 00018-T-06-001. Some photographs in this document are copyrighted photographs not owned by the U.S. Government. The Contractor grants to the U.S Government, and others acting on its behalf, a paid-up, nonexclusive, irrevocable, worldwide license in such copyrighted data to reproduce, prepare derivative works, distribute copies to the public, and perform publicly and display publicly by or on behalf of the Government. All other rights are reserved by the copyright owner(s) and reprint permissions must be requested from those copyright owners. Sponsoring groups were the Federal Highway Administration Office of Safety Research and Development (C. Tan, A. Zineddin, and H. Valadez), the Federal Highway Administration Office of Planning, Environment, and Realty (Water and Ecosystems Team) (D. Durbin, M. Gray, and P. Garrett), and the Federal Highway Administration Western Federal Lands Highway Division (B. Allen). Contracting Officer's Technical Representative (COTR): Dennis Durbin. Contracting Officer Technical Manager (COTM): Abdul Zineddin. 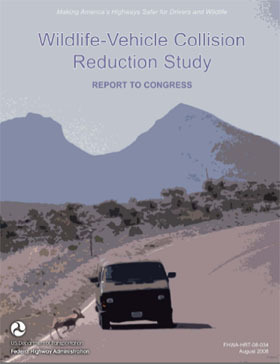 Under the SAFETEA-LU Congressional Bill, the Secretary of Transportation was directed to conduct a national wildlife-vehicle collision (WVC) reduction study. The study was to advance the understanding of the causes and impacts of WVCs and identify solutions to this growing safety problem. This report contains the findings of this study, beginning with estimates on the current magnitude and trend for WVCs in the United States. Based on several national datasets, the study found that there are between one and two million WVCs annually in the United States and that the number is increasing. Estimates are provided for the costs associated with WVCs, and the impact of direct road mortality is described for 21 federally listed threatened and endangered species. The core of the report is an in-depth review of over 34 WVC mitigation methods assembled from information obtained from hundreds of literature sources (both published and "gray" literature). Each mitigation measure is described in detail, and information including case studies, benefits, costs, undesirable effects, and design guidelines is provided. The report also covers planning and design considerations and provides cost-benefit analyses for the mitigation methods that had sufficient data available to support these analyses. A working group of seven national experts provided input and evaluated the effectiveness of the mitigation methods, categorizing them as either recommended for implementation, recommended for future research, or not recommended for future research or implementation. A summary of their evaluation is included in this report. Recommendations for implementation of effective measures and for further investigation of promising mitigation measures are provided. Isn't This Just a Rural Problem? How Many Accidents Are There? Is the Number of Accidents Increasing? Figure 58. Photo. Long bridges do not have to be excessively large to provide ample space for wildlife crossings. AVC Animal-vehicle collisions. Collisions with wild and domestic animals in cases where domestic animals could not be separated from the dataset. WVC Wildlife-vehicle collisions. Collisions with all species of wild animals. DVC Deer-vehicle collisions. WVCs that involve only deer. A separate term is used for deer and no other specific type of animal because deer account for a majority of WVCs when data are available. When information is specific to one type of animal other than deer, no abbreviation is used (e.g., moose-vehicle collision). ADT Average daily traffic, is defined as the total volume during a given time period (in days), greater than 1 day and less than 1 year, divided by the number of days in that time period. (1) In this report the time period is always 1 year. CaMg Chemical formula for calcium magnesium acetate, a common alternative to road salt for deicing. CSD/CSS Context-sensitive design/context-sensitive solutions, is a planning and/or design strategy that attempts to consider scenic, aesthetic, historic, environmental, and community values. FARS Fatal Accident Reporting System, is a national dataset that includes all crashes with a human fatality. GES General Estimates System, is a dataset that enables estimates of national crash numbers based on a national sample. GIS Geographic Information Systems, which relates to spatial data standards and in some cases, sets of spatial data. HSIS Highway Safety Information System, is a dataset that includes all reported crashes from Washington, California, Illinois, Maine, Michigan, Minnesota, North Carolina, Ohio, and Utah. LED Light-emitting diode, a technology used for, among other things, lighted signs and flashers. MUTCD Manual on Uniform Traffic Control Devices, which provides national guidance and standards for, among other things, warning signs and signals. ROW Right of way, refers to the area owned by the transportation agency, including the roadside. SAFETEA-LU Safe, Accountable, Flexible, and Efficient Transportation Equity Act: A Legacy for Users, which is the primary congressional bill for surface transportation programs, signed by President George W. Bush in August 2005. $ Followed by a numerical value refers to dollar value. Unless otherwise specified, reported values are in U.S. dollars. Can$ Followed by a numerical value refer to Canadian dollars. € Followed by a numerical value refers to Euros.